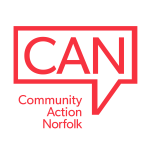 Community Action Norfolk's office is located, between Jewsons and Travis Perkins, some parking is available on site. Spaceport - We tried finding this out and discovered the internet hasn't quiet agreed the definition of a spaceport. However, we figure if you choose to visit us using a spacecraft you probably can work out your own journey details.